You know what they say about assuming, right? So sometimes I assume that if I can find an ingredient at the grocery store here, everyone else can easily find that ingredient too. But it’s not always true! And I’ve had a few people ask me about mushroom stock. I always buy cartons of it and I figured that they sold them everywhere. Well, I guess not. Since I did a post on how to make your own vegetable broth from kitchen scraps last month, I thought I’d do a post about how to make mushroom stock this month. So now all your broth and stock needs are covered! 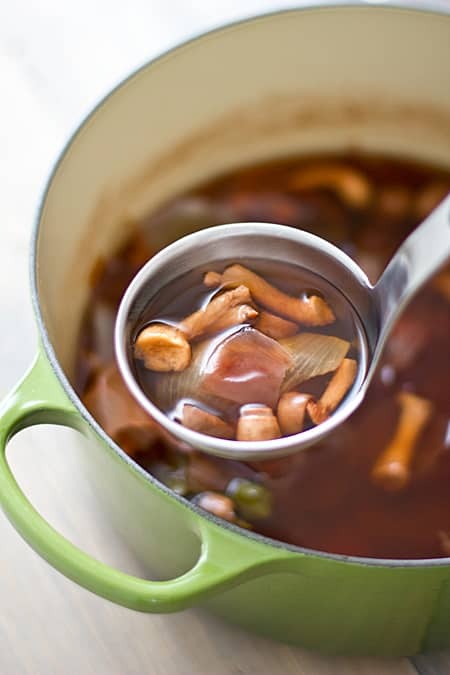 Mushroom stock is a great staple to keep on hand if you don’t eat meat–the deep, rich flavor and color makes it a great substitute for beef stock. Like vegetable broth, most mushroom stock recipes call for lots of fresh mushrooms and vegetables. Some of them even use dried mushrooms too. And I am way way way too cheap to buy expensive dried mushrooms just to make stock. Even the fresh mushrooms add up in cost if you’re using more than just the white variety. So I set out to come up with a mushroom stock recipe that, like vegetable broth, used kitchen scraps. Cheap! No waste! So if you have your freezer bag started for vegetable broth, you’ll want to start another freezer bag for scraps to use to make mushroom stock. And now, whenever you make something with mushrooms, instead of trimming the stems, pop them off and put them in the freezer bag. The more kinds of mushroom stems you have, the better–I used white, cremini, portabella, and shiitake mushrooms in this batch of stock. (Bonus: Pulling off the stems instead of cutting the ends off will help you save on prep time too.) Leek trimmings, skins and trimmings from onions and shallots, carrot peels and trimmings, and leaves and ends of celery can be added to the bag too. But make sure your bag consists of about half mushrooms. (This is mushroom stock, after all!) Oh, and everything you put in the bag should be clean–nothing dirty, nothing rotten, nothing moldy. When you’re ready to make your stock, combine the frozen scraps with double the amount of water in a large Dutch oven or stockpot. So if you have 4 cups of scraps, add 8 cups of water. You can also add a minced clove of garlic or two, a bay leaf, springs of parsley, thyme, or sage, and even some fresh veggies if you like. A splash of red wine is a nice addition too. If you want to make the stock into mushroom broth, just season it to taste with some salt and pepper when it’s done cooking. Easy! Bring the mushroom stock to a boil and then let it simmer partially covered on low heat for 45 minutes. After 45 minutes, uncover the pot and let it simmer for 30 minutes more. Let the stock cool and then pour it into a bowl through a fine mesh strainer. Use a wooden spoon to press the vegetables against the strainer in order to extract as much stock as possible. You can use the stock immediately, keep it in the fridge for about a week, or freeze it for a few months. I like freezing mine flat in freezer bags. (Need some freezer labels so you remember what you have frozen and when it needs to be used by? Oh, we have some!) You can stack them in your freezer and they’ll take up a minimal amount of space. 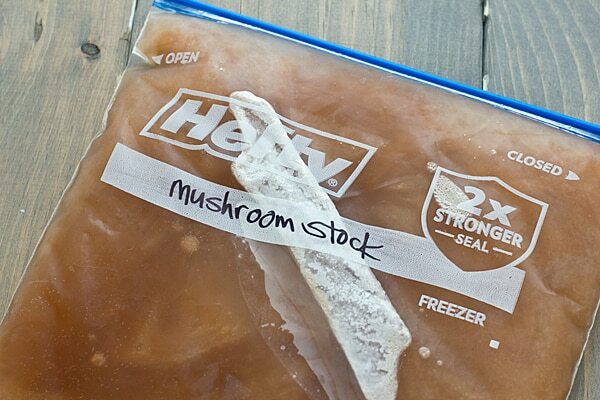 When you’re ready to use the stock, let it thaw in the fridge for about a day. This post was originally published on February 5, 2013. I hate wasting perfectly good vegetables to make mushroom stock–using kitchen scraps is a cheaper, less wasteful alternative! Combine all ingredients in large Dutch oven or stock pot. Bring to a boil, then reduce heat to low. Simmer partially covered for 45 minutes; remove lid and simmer uncovered for 30 minutes more. Allow stock to cool, then pour through a fine mesh strainer into a bowl. 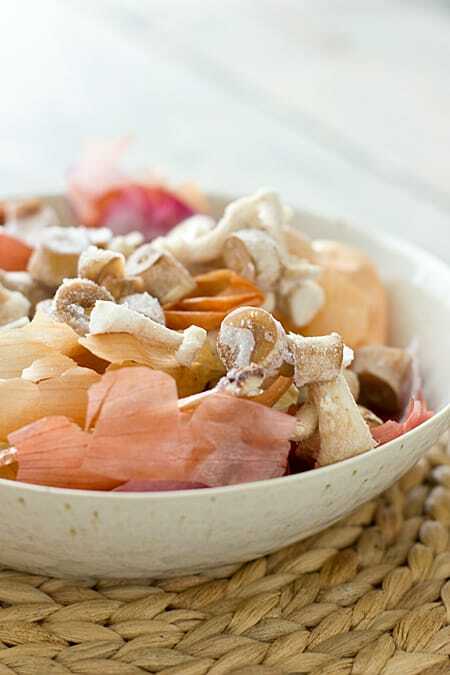 Press vegetable scraps against the strainer with a wooden spoon in order to extract as much stock as possible. Discard solids and store stock in a plastic container or freezer bag. If you want to make broth rather than stock, simply season the stock with salt and pepper to taste after it’s done cooking. I never even thought to use mushroom stock in the place of beef! Thank you so much! I threw a bunch of vegetables scraps in my pot when I made chicken stock the other day, but I never thought of freezing them. What a great idea!!! I’ll have to remember that because most of my scraps end up in the compost and would be better served in a veggie stock. Great post! Yeah, now I just compost anything that won’t work in stock or broth. 🙂 My compost hasn’t been doing much lately anyway–I guess it must be the cold weather, but it just sits and sits and doesn’t decompose! First of all, fantastic recipe. I have a hard time finding mushroom stock where I live, but I really love the stuff for vegetarian/vegan recipes. I love the color of yours, I just want to dive into a pool of it and splash around a little. Also, I just found your site today, and I really love you.. it.. am I coming on too strong? What I am trying to say is I’m a fan!! Gorgeous photos and yummy looking recipes!! Yum! I seriously need to do this. I’m so used to composting our scraps that I don’t use the full potential of them. Such a great recipe for veggie stock – it looks so delicious and easy! ohh so simple but so yummy!! I’m going to try this. Whenever I have to use dried mushrooms, I save the soaking liquid to use for stock! I wouldn’t want to buy dried mushrooms just to make stock, but if I’m using them anyway for something else, that liquid is really good. I totally cheated the other night and my your chili with chicken stock – and didn’t tell my sister. I’m a terrible sister!!! Need to make this – your mushroom gravy was awesome. This reminds me of the time that a friend mistakenly identified as vegetarian a stew she’d made out of this and that. She forgot that she’d thrown in bacon bits for flavor. A couple other people have said, “You can eat the baked beans!” and they don’t remember that most baked beans are made with bacon. I’m sorry to hear that the casserole made you so sick. Oh yes, I’ve learned when ordering soups at a restaurant, I can never ask, “Is this vegetarian?”, I always have to ask, “Is this made with chicken or beef stock?” A lot of people really don’t understand vegetarianism! This is such a creative idea – I never would have thought of it! I just recently made chicken stock from scratch for the first time, now it looks like I’ll be tackling this! yum! That’s sounds pretty easy! I love that it’s a way to use the waste too. Waste not, want not :). I love anything that helps reduce waste! A great, inexpensive way to use up everything! Absolutely love this, thanks for sharing the recipe. It will get lots of use! This is such a great thing to know how to make! I have a ton of vegetarian friends, so I use mushroom stock when I make my french onion soup a lot of the time. I’ll definitely be trying this out soon! I just saw a French onion soup recipe made with mushroom stock–I’m going to have to try that soon! Fortunately, we have several farmer’s markets where I live and one or two have fresh mushrooms from the farm. They are fairly reasonably priced but I certainly have missed using this in this frugal way. Not anymore! Thank you. I wish I could find mushrooms at our farmers market here! I make a Risotto with mushroom and thought it might be nice to use mushroom stock. Thanks for the tips! Interesting. I’ve never heard of it before, but I’ll give it a try. Sounds like it might be nice. Thanks. I did make this stock and it was terrific. When I used it for the Risotto it was really super. Rich and flavorful without the saltiness. I’m glad it turned out well for you! I love making risotto with homemade stocks – you get so much more flavor that way! I just made a quick stock to sub for beef broth, and as I didn’t simmer it for very long (nuked it for ~20 minutes in the microwave) I’m wondering if I could save the stems and use them again – ? How can I tell if the stems are “used up”? Oh, this looks great! We always feed out scraps (we eat pretty much all of our veggies anyway) to our worms in our veggie garden. Its interesting how we become accustomed to buying things that we can easily make at home. Will need to buy a bigger freezer to store all of our scraps … and then make stock. Yum. Fantastic recipe! I never thought of freezing stocks before, that’s definitely genius! Thank you for sharing! So, the mushrooms do ok being frozen? Can you freeze mushrooms for reasons other than using them in stock? Sometimes I buy mushrooms intending to make something big with them, then don’t get around to doing the big dish. 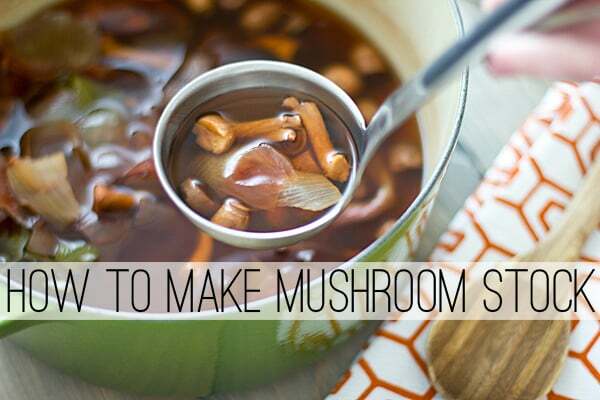 I would love to freeze the mushrooms instead of wasting them. I guess I just thought that they wouldn’t freeze well. Since I love the mushroom flavor, but not the texture, I thought I would make a stock. This seems most like what fits my needs. If I buy mushrooms, I often just use a couple, so I began drying then freezing them. It makes for a nice, robust flavor, that I adore. i found mushrooms on sale this past week, so am attempting my first stock, which I will condense and freeze for glazes or sauces or soup base. Can’t wait! I have a few bags of frozen stems I was saving for just this purpose, but I’ve never done it. I would think drying the mushroom stems in a dehydrator or low oven–or even roasting them–would intensify the flavor. Ever tried that?